It has arrived: The posting date of my first Daring Baker's Challenge!!! I hinted in my Valentine's Day post about this cake, and even snuck in a hidden picture that was hardly what you would call visible. I will admit that I was not looking forward to this recipe for the mere fact that I attempted a flourless cake about 8 years ago and the result was an unappetizing mess. It didn't dawn on me until I finished this challenge that my previous failed attempt may have been because... I hadn't a clue what I was doing (shocking, I know!). 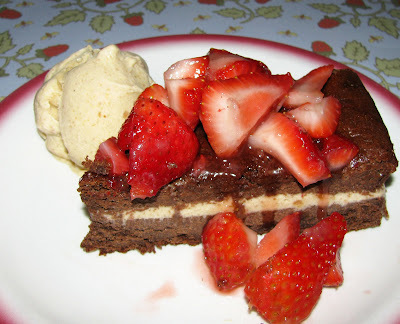 The February 2009 challenge is hosted by Wendy of WMPE's blog and Dharm of Dad ~ Baker & Chef: "We have chosen a Chocolate Valentino cakee by Chef Wan; a Vanilla Ice Cream recipe from Dharm and a Vanilla Ice Cream recipe from Wendy as the challenge." We were given the option of choosing any variety of ice cream, and any variety of glaze, topping, or puree if so desired. This venture was much more successful than my original attempt so many years ago! This cake is deliciously decadent and is perfectly paired with peanut butter. The cake's texture is thick and flavor translucent, and because this ice cream is a custard base and not sweet, although frozen, neither cake nor ice cream truly retain that sensitive composition which often accompanies frozen desserts, and that makes for a distinctive combination. Wow that looks great. I like what you did with the layers and I love the strawberries. I think you did a great job! Oh YUM, you know what your cake reminds me of? When I as a sprout, they had this chocolate and peanut butter in a jar swirled together. On weekends, my mom would use it to make me a sandwich using that and strawberry jam! My mouth is wateing as I look at your photo! Love how pretty it all turned out, and the photos make it as if you can reach inside the computer screen pull it out *trying* lol Awesome job, and again, your site looks fantastic! Looks to DIE for....I love it in the heart shaped pan. I need to buy one of those and make this yummy cake. Wow your first challenge turned out great! Love the pictures! Congrats! Job well done!! Yay! You have successfully completed your first DB challenge, with great aplomb! Strawberries and peanut butter sould fabulous together. Terrific! 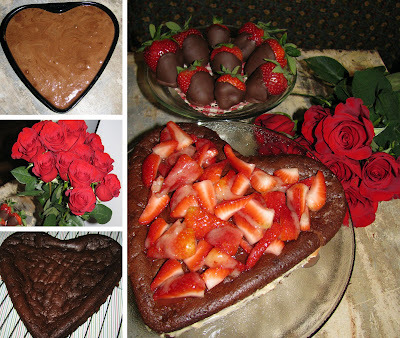 I love the strawberries with chocolate, it's so pretty and a great taste combo. Peanut butter too, mmmm! So, so, so good! Wow! What a way to begin as a new Daring Baker. Loads of comments! And of course! This tasted as good as it looks! Yum, that looks absolutely delicious! Peanut butter ice cream, I definitely need to try that! We Swedes aren't big on peanut butter, I like it but you never find that kind of ice cream here. Ohmigawd - that cake with the strawberries look absolutely delicious! I wish I were as creative! Congrats on your first challenge! Oh my GOSH! Your cake looks fabulous! I love the strawberries on top, and the peanut butter ice cream sounds so good!!! Now that I've started making ice cream I dont know if I can stop...It's addictively delicious, and peanut butter is now on my list. and CONGRATS on your first challenge!! Amazing job! 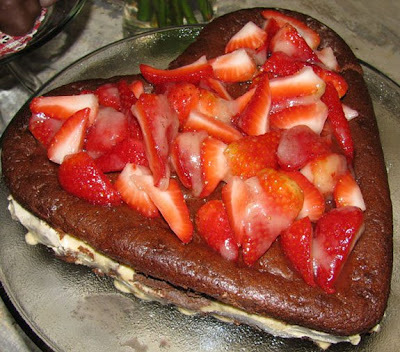 This does look like a perfect Valentine's day dessert! Well this flourless cake appears to be a perfect hit--bet you are glad you did try again. Looks so fabulous with those strawberries! Great job with your first challenge! Oooo those strawberries are a perfect addition to that beautiful cake! Why didn't I think of that?? Because I'm just not as creative as you :P Congrats on your first DB challenge, you rocked it out! Welcome to the Daring Bakers! I would have never thought to do peanut butter ice cream!